Akin Akintayo: Nigeria: One look at our Dutch website - Ewww! I suppose by now I already have a reputation for being a nit-picking imperfectionist of sorts who has a penchant for finding errors and atrocious mistakes in official documents but almost always ends up with problems in my exposés. As I have tried to make the keener observers understand, my blog and comments about websites are personal, but those websites under review are official, they are the public face of the institutions that commission them, someone gets paid to provide that service and at the least before publication somebody should proofread the stuff before it goes online. I am beginning to think that the issue of attention to detail is systemic and endemic in Nigerian officialdom and it is not restricted to the confines of Nigeria’s borders. After Babcock University  and The Nigeria @ 50 website . I paid a visit to the website  of the embassy of the Federal Republic of Nigeria in The Netherlands this morning and the first impressions could not be more amateurish, the site looked like the mock-up creation of a kindergarten school finger-painting class, it was appalling – but that is beside the point. The home page had an important notice of an event that took place between the 5th and 16th of July, 2010, I think today is the 8th of October, 2010. It was titled “e-Passport Intervention Exercise for Nigerians”, I am getting ahead of myself here, but what I have done is taken a snapshot of the page and presented it as graphic with the numbered parts being the particular issues I want to concentrate on. Item 1; shows how addresses are written and spoken out in The Netherlands and usually in most of continental Europe, the street comes first and then the house number. Nothing wrong with this. Item 2; “Intervention Exercise”, whilst I agree Nigerians are given to verbosity, myself included at times, giving verbosity vacuity such that context is implied from redundancy is just an excess. 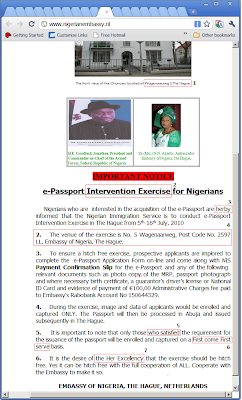 However, maybe the “Intervention” implies the normally smooth process of obtaining an e-Passport does not work for all sorts of reasons and the ambassador has decided to intervene. Otherwise, it is just a registration or validation exercise, the use of intervention confers on the word irrelevance pretending to official importance. Item 3; speaks for itself, the spelling checker on the author’s computer even if set to Dutch would have flagged that as incorrect. Any public relations department MUST ALWAYS have their copy spell-checked before publication, I dare say, it is a sin not to. Hereby, whack the miscreant across the knuckles. Item 4; as I stated in Item 1, addresses are written in a particular way in The Netherlands, it helps the post get to its destination and even GPS systems ask for addresses in that order. I will be as uncharitable as to suggest that some greenhorn who has just been brought over from Nigeria to probably lord it over those who have a clue about things here has thrown their weight about and come up with this nonsense. It might well be the Nigerian Embassy but it is located in The Netherlands, you promote Nigerian culture and values whilst adhering to Dutch standards of communication. That address should have been The Embassy of Nigeria, Wagenaarweg 5, 2597 LL, The Hague. The use of Post Code No. is redundant but proves my point, a tyro wrote this. Item 5; English, I believe is still the language for the dissemination of official documents in Nigeria. If that be the case, it is not too exacting to expect the usage of correct grammar and number agreement. Would “who have satisfied” be better than “who satisfied”? In the same sentence, the indefinite article “a passport” would have been preferred to the definite article “the passport”, I suppose the excuse of English not being the author’s first language might suffice in Nigeria, but surely not in The Netherlands, relatively, Nigerians should and must be better speakers, writers and users of the English language than the Dutch. Item 6; There might be some disagreement about the use of hyphens in this phrase, which means there would be no preferential treatment or reservations. It is a contraction of “the first to come is the first served”. Hence, it should be first-come first-serveD, not forgetting the essential “D” at the end. Phew! Item 7; “The Her Excellency”, our pre-occupation with obsequiousness and predilection for titles can get us into serious trouble. Perish the thought that the ambassador is being addressed as such. I swoon with a backhand to my tilted forehead. Going back to the caption that accompanies the photograph of Dr. (Mrs.) N. N. Akanbi – She is the Nigerian Ambassador to the Royal Kingdom of the Netherlands in The Hague if we are to follow with consistency the way the president has been addressed in the photograph to the left of the ambassador – maybe I am just being pedantic, but surely, it is not too much to ask for. It is also my desire that all publications from the Embassy of the Federal Republic of Nigeria have a modicum of professionalism, attention to detail and show us all in better light than this. Those who fail to see the big picture concerning this post, may fault you for criticising Nigeria. 1) Failure to learn from previous mistakes. Aderinola (of "Thy Glory O Nigeria") has correctly pointed this out. The shoddy web site if further confirmation of this phenomena. I hope people see things the way you have seen the situation. I have been hamming on this topic for long, the need to ensure that we are meticulous with our web presence. You will not believe that I tried to email the embassy on the address given on the homepage and it was bounced. I am hopeful that eventually we would make headway on these matters. As for things not going right concerning Nigeria, it is hard to be astounded. The e-mail bouncing, is symptomatic of the quality of the site. The criticism is constructive you explain solutions and give reasons, I see no malice at play. This presence on the internet, is representing on official body, no less than the Government, so things should be in order. If as potential outsider, say an investor who knows little about the place, came across the site as it stands, it does not reflect an image of government or country that is professional and scrupulous. Why bother with Nigeria, when there are plenty of other better run governments? One would guess, the site has been put up according to government guidelines ie a standard of some sort. This begs the question, what standards are these? Wow Akin, you sure took your time to critique the website. It was constructive and I do wish someone would listen. You would think it was such a hard job to make a website presentable! Bloggers are doing it everyday, how much more a graphics company that was PAID and the govt officer supposed to oversee such!! My main concern is that many Nigerian organisations have not realised that a web presence now speaks volumes about what is to be expected of doing business with them. I do hope they take the issues on board.